This monster high dress was so much fun to make. The wild blue and black animal print was fun accentuate with crinoline and black ribbon. 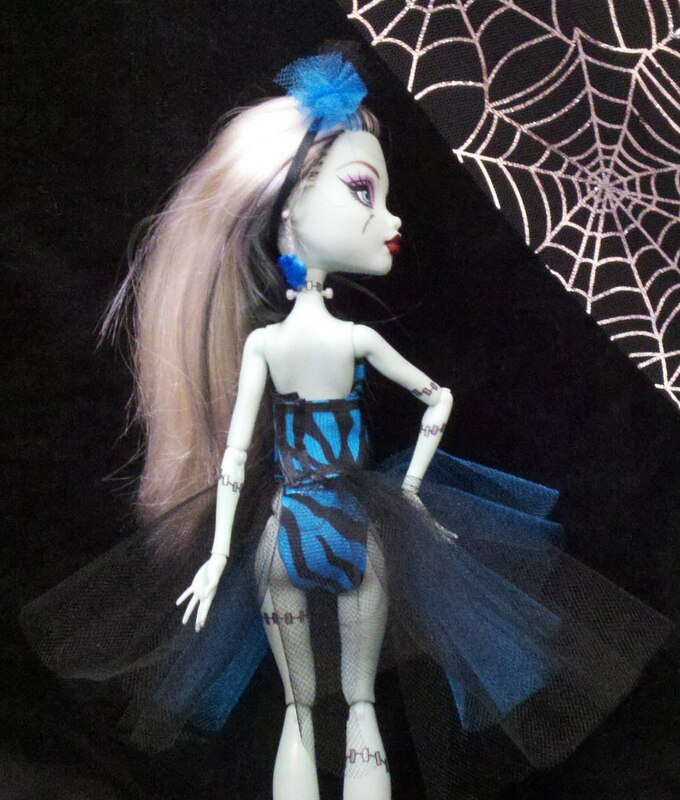 This dress was made with Frankie Stein in mind since this shade of blue and black are her signature colors. 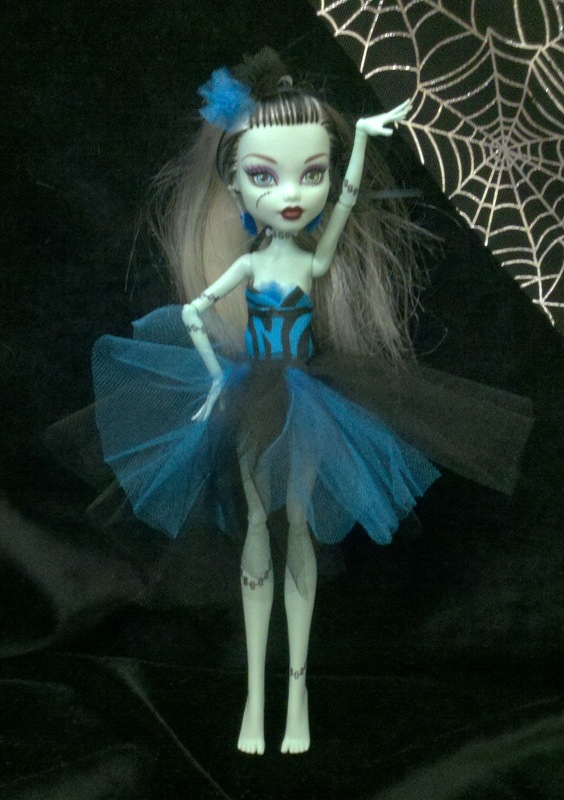 The bodice has a sweetheart top and the crinoline skirt is in varied lengths to give it a monsterish look. One 1 1/2" piece for the bodice top. One 3" piece for the waist. Once 4" inch piece for the bottom. 2. Cut the 1/8" ribbon into two pieces that are 3" long each. 3. Cut the black crinoline into 3 pieces that are each 14" wide by 4" long. 4. Cut the blue crinoline into 2 pieces that are each 14" wide by 3" long and one piece that is 2" x 2 1/2". 5. Fray check the ends of all the ribbon pieces to ensure they don't fray while you're working with them. 6. First we'll make the top of the bodice. Fold the 1 1/2" piece of ribbon in half length wise then fold over criss cross twice to make a triangle. Cut away excess ribbon and apply fray check. Sew in place along the bottom of the triangle. 8. With right side up, sew the first triangle 1" away from the left edge. Try to sew close to the edges. 9. Sew the second triangle next slightly overlapping the first triangle. 10. Fold the 2" x 2.5" blue crinoline in half length-wise. Gather and sew the crinoline leaving about 1/4" at the top. 11. Place the crinoline piece in-between the two triangle tops of the bodice. 12. Trim off any excess on the inside. 13. For the skirt, gather the top of one of the black crinoline pieces unto a needle and thread. 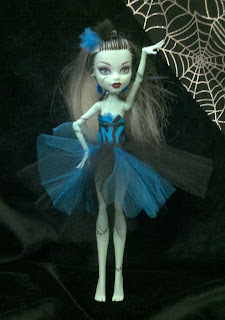 Add a blue crinoline piece and keep alternating until all the pieces are on the thread. 14. Once the crinoline is gathered, make sure that it is the width of the waist (3 inches) and begin sewing it in place at the bottom of the bodice. 15. Add ribbon trim to the bottom and top of the bodice so that the stitches are covered. This adds a nice finishing touch. 16. Cut a 1" x 1/4" piece of velcro. On the right side sew a piece of velcro to the outside of the dress. On the left side sew the other piece on the inside of the dress. 17. In the center of the front of the dress at the bottom of the bodice, sew one end of the 4" ribbon. The center of the front of the dress would be directly in the middle of the triangle tops. 6. Sew the other end on the back on the left. This will form the bottom. 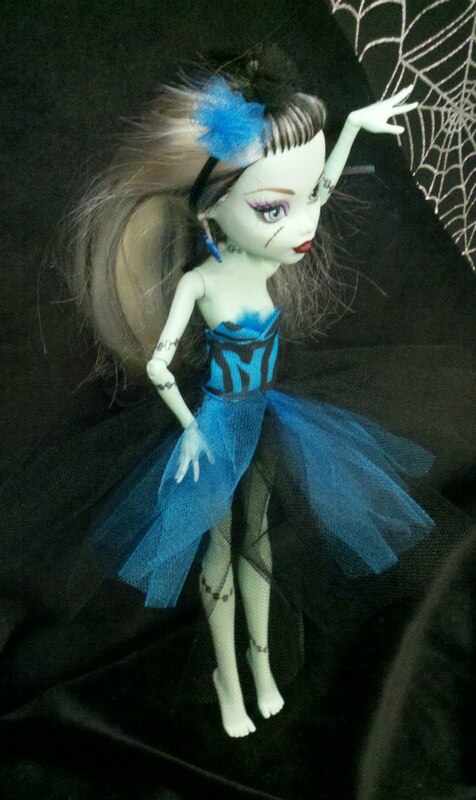 Now you're Monster High dress is complete! This little dress would make a great Holiday or Birthday gift. 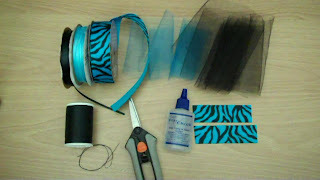 For More Cool Projects Watch How To Bliss videos on Youtube and blip.tv.